There’s going to be a lot of participants trying to check-in for the race. 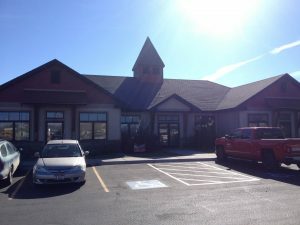 If you want a fast and easy check-in experience come on Friday for early check-in at The Dealio office, located at 859 S. Yellowstone Hwy, #1002. Early check-in will start at 2:00 p.m. and run until 8:00 p.m. on Friday, Oct. 14th. *Race day check-in will begin at 8:00 a.m. and last until 11:00 a.m. and will take place at the lobby of Hemming Village. With just days until race day it’s more important than ever that you know exactly what you are doing on Saturday! We encourage every participant to read and understand ALL role descriptions so that you have an understanding of what you and your counterparts will be doing. Good luck everyone! SURVIVORS – You will be running the 5K with three flags (optional) attached to a belt. Your goal is to survive the race with at least one flag remaining on your belt (There will be at least one “Flag Reload” station about halfway through the course). The course will be clearly marked with signs and Volunteers (orange shirts) along the way. When you approach “Infected Zones” be prepared for Zombies to attempt to pull your flags. As a side note, Zombies have been instructed to use “good judgment” and common sense when chasing Survivors. For example, if you are running with your young children, they should know to not go too hard after their flags. This year we are giving Survivors the option to run without flags if they’d like to just enjoy and experience the course without having to worry about getting their flags pulled. TRANSPORTATION: Survivors will park their vehicles at/near the finish line area of Hemming Village, then starting at 11:00 a.m. they will catch a Salt Lake Express bus out to the starting line at Nature Park. This way you will finish by your vehicle at Hemming Village. ZOMBIE RUNNERS – You are basically a Zombie that gets to run the race. You are NOT allowed to pull runner’s flags throughout the course. However, you are permitted to chase & “harass” runners inside assigned Infected Zones. You may choose to “zombify” yourself or get transformed at the Zombie Makeup Station at the starting line. If not transforming yourself, Zombie Runners need to be sure to catch the early buses departing at 11:00 a.m. so they can be shuttled over to the starting line to receive their makeup. 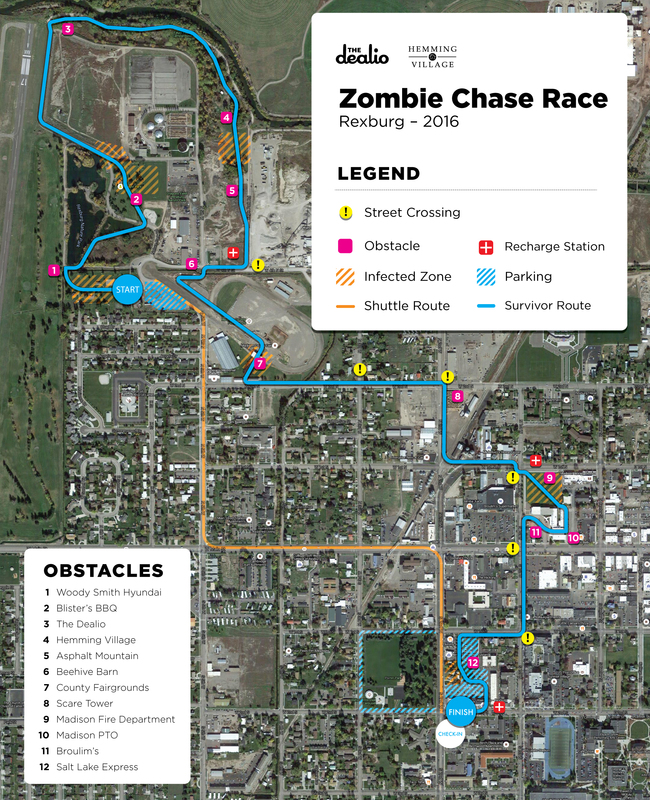 TRANSPORTATION: Zombie Runners will park their vehicles at/near the finish line area of Hemming Village, then starting at 11:00 a.m. they will catch a Salt Lake Express bus out to the starting line at Nature Park. *Zombie Runners will have priority on the early buses to ensure that they have time to get their makeup done. ZOMBIES – You will be stationed at an Assigned Infected Zone throughout the race. While there, your goal is to make the race challenging for the Survivors as they pass through (using good judgment). TRANSPORTATION: Zombies will be responsible for getting themselves out to and around their respective “Infected Zones.” Once the last wave of runners passes, Zombies have the option to run the course back to the finish line or to get themselves over to another infected zone to help out the other Zombies. Zombies & Zombie Runners may choose to “zombify” yourself or get transformed at the makeup station at the starting line. If not transforming yourself, Zombies & Zombie Runners need to get transformed at the makeup station at the starting line provided by Evans Hairstyling College. The Zombie Makeup station will be set up at 10:00 a.m. at the starting line at Nature Park. We recommend that those registered as “Zombies” arrive between 10:00 a.m. – 10:45 a.m., since those registered as “Zombie Runners” will be arriving off the buses from 11:00 a.m. – 11:45 a.m.
Evans Hairstyling College will be doing their best to get everyone their zombie makeup on but it will probably be difficult to get to everyone if they all show up right before the beginning of the race. If you want lots of time attention to get madeup as a zombie please arrive early. There will be two portable bathrooms at the start as well as two bathrooms in Nature Park at the starting line, and then there are a few along the course. One in Eagle Park, one at the Fairgrounds, and then at the finish line at Hemming Village.